At one time or another, almost everybody has the need to capture your screen. You might be asked by a tech support representative to grab a screenshot to help diagnose a software problem, or you may just want to save and share an amusing part of a Web page or Facebook post. For the occasional user, Apple provides two free screen capture methods. The first, keyboard commands to capture the whole screen (Command-Shift-3) and a selected portion of the screen (Command-Shift-4), saving the images to a file, have been present in every version of Mac OS since 1984. The second is the Grab application (in /Applications/Utilities), which was introduced with Mac OS X. Both of these methods work reasonably well, but each has its own quirks and drawbacks for people who need to shoot a lot of screenshots, leading to the rise of many apps that provide additional features and convenience. Ambrosia Software’s Snapz Pro X was among the first, tracing its lineage back to 1996, garnering many passionate users down the years; I’m one of them (it also won a Macworld Editor’s Choice Award in 2004). But Snapz (I’m shortening the name from here on for convenience) hasn’t aged well, hasn’t kept up with the times, and is no longer the best choice, in terms of features or in value. Start Your Capture: Snapz Pro X’s capture palette allows you to choose your capture type and the destination of the image. 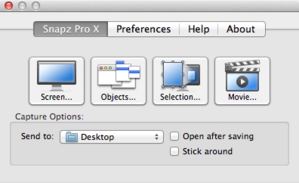 You begin a screen capture in Snapz by pressing a user-designated hotkey or choosing the program’s icon in your Applications folder. The screen freezes and the program’s main window pops up, allowing you to choose from the four capture types. Screen captures the entire screen, or whatever screen you choose if you have multiple monitors. Objects captures the contents of any open window, even if the window is partially obscured. You can select multiple objects in a single capture. You can also select the menu bar, but not menus. The Selection capture type gives you crosshairs to select a portion of the screen; this is also the capture type you use to shoot menus (older versions of Snapz captured menus more cleanly using the Objects capture type, so this is a regression in the current version). Finally, the Movie capture type allows you to select a portion of your screen to record video and optionally two audio tracks: the system audio and a microphone track. After choosing any of the four capture types (by clicking its button or pressing the 1 through 4 keys), you select the exact part of your screen you want to capture. You also get a settings palette, allowing you to change different aspects of the capture; this palette changes to provide appropriate settings for each capture type. For example, you can scale the capture, change it from color to grayscale, insert a watermark, choose the output file format, and decide whether the cursor should be visible. A Preview button shows you how the image will look with all settings applied, which can be a big time-saver. Pressing the Return or Enter keys remembers your settings for future use and finalizes the capture. Finely-Tuned Output: Unlike most other programs, you can change the look of your image before the capture, rather than after. Besides the file format, you can adjust the color, scale the image, and more. Clicking the Preview button shows you exactly how the final image will look. The program allows you to automatically name the capture files with a prefix and serialized number, or you can name each shot as you snap it. You can pick a folder as the default destination of the files, and you have the option of using email, a printer, or the Clipboard as the destination instead. It does a good job of captures from high-resolution Retina displays as well. Snapz looks and acts almost identically to version 2, released in 2004; it’s as if it has been preserved in amber. The program has actually been rebuilt in the intervening years so it still works with OS X, but there are no major new features (in fact, some features have been removed). In the meantime, other programs have come along with broader feature sets, with many useful features Snapz lacks. Techsmith’s SnagIt and Global Delight’s Voila both automatically scroll and capture long Web pages. SnagIt’s All-In-One capture type understands window regions, often making it much easier to capture parts of application windows, such as toolbars and buttons, which otherwise requires exacting pixel-by-pixel nudges of the Selection rectangle. Both programs provide image editing, so you don’t have to use a separate program to crop, annotate, or otherwise touch up your screenshots. Both allow you to use your computer’s iSight camera to snap images. Both allow a timed delay before shooting an image, a feature so basic that even Grab boasts it. 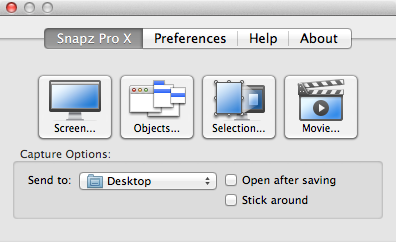 With either program, you can invoke captures from the menu bar, so you don’t have to remember hotkeys. Depending on the program, you can share your captured images with social destinations like Twitter or Facebook, media destinations such as Flickr, Evernote, and YouTube, and send files to FTP sites. Snapz (and SnagIt) are fine for shooting short videos, but neither is well suited for serious screencasting; for that I recommend you turn to the excellent ScreenFlow, from Telestream ($99), which has far superior tools for recording your screen and editing the result. Snapz doesn’t allow you to pause and resume a video recording, an important feature for screencasters. A big annoyance with Snapz is that it captures video files in a proprietary intermediate format that needs about twice as much time to render and save a finished movie as the length of the video, and you can’t take another capture of any kind until you render the last video. Saving video in SnagIt and Screenflow has no such limitation. One of the major problems with the $69 Snapz is that compared to competing products, it’s not as good a value (a previous $29 still-capture-only version has been discontinued). SnagIt is $50, and comes with a dual license for both the Mac and Windows versions. (SnagIt is widely considered to be the best screen capture utility for Windows.) Voila costs $30. Given that either program can do so much more than Snapz, I can’t recommend you spend the extra money. Another good screen-capture program, Evernote’s Skitch, is free. Snapz is not available on the Mac App Store. It’s not often that I write a review and end up changing a 17-year-old workflow as a result (that’s how long I’ve been using Snapz). Snapz is a fine program, and it certainly gets the job done. But for me, and for people who are new to screen capture software, there are alternate choices that are both better and less expensive.